THE intense scarcity of funds in the interbank bank money market is expected to subside this week, with cost of funds trending further downward, due to expected inflow of N530 billion from matured FGN bond and treasury bills. The inflow comprises N450 billion payments for matured FGN bonds and payment for N52 billion worth of matured treasury bills. According to analysts, the inflows are expected to occasion further moderation in interbank interest rates this week. “We expect further moderation in interbank rates amid expected ease in financial system liquidity”, said analysts at Cowry Assets Management Limited, a Lagos based investment firm. Also commenting, analysts at Afrinvest, a Lagos based investment firm, said, “In the week ahead, we expect system liquidity to remain tight at the start of the week but improve towards the end due to scheduled OMO maturity of N53bn and Bond maturity of N480.4bn. The CBN is likely to conduct several OMO auctions to mop-up liquidity but we still expect rates to trend lower. Last week, a combination of outflows through treasury bills investment, foreign exchange purchase aggravated the intense scarcity of funds in the interbank money market, prompting interest rates on Open Buy Back (OBB) and Overnight (OVN) to jump to 140 per cent and 150 per cent respectively on Tuesday, from 60.8 per cent and 66.8 per cent at last week’s close. OBB and OVN rates remained at Tuesday’s levels till Thursday when it moderated to 26.7 per cent and 29.3 per cent respectively on account of inflows from the Local Contractor Bond of N116 billion and OMO bills of N25 billion maturities which hit the system. Consequently OBB and OVN rates eventually dropped to 27.5 per cent and 29.7 per cent on Friday, indicating a 33.3 and 37.1 percentage points decline when compared with the closing rates for the previous week respectively. Reflecting the intensity of the scarcity of funds before Thursday, the treasury bills offered by the CBN recorded 25 per cent under-subscription. While the apex bank offered N272 billion worth of OMO and primary market bills, public subscription stood at N202 billion, with the apex bank selling N98 billion. The N167 billion worth of Primary market bills offered by the CBN recorded 106 subscription of N177.9 billion but the apex bank sold N89.6 billion, with stop rate ranging from 13.5 to 18.9 per cent. On the other hand the N105 billion worth of OMO bills offered by the CBN recorded 22 per cent subscription, while the apex bank sold N8.4 billion with stop rates ranging from 18 to 18.6 per cent. The naira last week experienced its highest weekly gain of N30 in the parallel market where it appreciated to N375 per dollar against the dollar. The parallel market exchange rate which closed the previous week at N405 per dollar fell steadily during week owing to combination of 100 per cent dollar supply to bureaux de change (BDC) by the CBN. During the week, the apex bank increased dollar sales to BDCs to $127.4 million from $63.7 million, in a bid to enhance the value of the naira in the parallel market. There were, however, mixed opinions on the possibility of further appreciation in the parallel market below the N375 per dollar. While some BDC sources were optimistic that the naira may further appreciate to N370 per dollar this week if the CBN sustains the $40,000 per week to each BDC some, however, believe that the N375 per dollar is the best that can be achieved for now except the apex bank lowers its dollar selling rate to banks and BDCs, which are presently N357 per dollar and N360 per dollar. 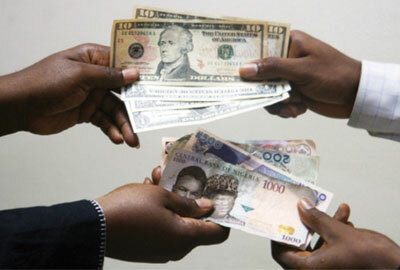 Last week the CBN increased its intervention in the foreign exchange market by $280 million to $3.63 billion. During the week, the CBN sold $100 million 7-45 days forwards in the wholesale market, $80 million for invisibles such as Basic Travel Allowance, Personal Travel Allowance, medical bills and tuition; and $100 million for the Small and Medium Enterprises (SMEs) window. Since Monday February 20, 2017, when it commenced the intervention, the apex bank has injected $3.63 billion by intervening in the forex market 19 times as follows: Tuesday, February 21, $417 million; Thursday, February 23, $231 million; Monday, February 27, $180 million; Friday, March 3, $350 million; Monday, March 6, N367 million; Tuesday, March 7, $100 million; Thursday, March 9, $170 million; Tuesday, March 14, $190 million; Wednesday, March 14, $150 million; Thursday, March 16, $100 million; Monday, March 20, $143 million; Thursday, March 23, $100 million; Monday, March 27, $185 million; Thursday, March 30, $100 million; Monday, April 3, $240 million; Thursday, April 6, $100 million; Monday, April 10, $100 million; Wednesday, April 12, $250 million; and $280 million on Tuesday, April 18. During the week, prices of Nigeria’s sovereign and corporate Eurobonds listed on the London Stock Exchange rose due to sustained interest in foreign investors. Commenting on the performance of Nigeria’corporate bonds on the LSE, Afrinvest PLC noted: “Nigerian Corporate Eurobonds continued to enjoy bullish sentiment as yields trended lower on all maturities save for the First Bank 2021 which rose 4bps. High yield Nigerian corporates trading at deep discount to par – Fidelity Bank 2018 (-1.4 per cvent) and Diamond Bank 2019 (-1.2 per cent) -received the most buying interest during the week as investors sought for bargains. The post N530bn bond, Tbills maturity to suppress scarcity of funds appeared first on Vanguard News.